Be prepared: a Scout's Motto. But really, gamers have to be prepared as well. If you get your party killed in GURPS, will you accept your fate? Are you ready to spend 24 hours playing games for charity? Is your luggage packed for the next game convention? These everyday occurrences go unrecognized in the gamers' world, but no longer! 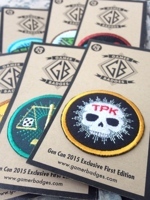 Gamer Badges takes the idea of prizes or merit badges and applies them to tabletop gaming. You can earn badges for owning games, playing games, going to conventions, participating in marathon sessions, and a variety of other accomplishments. There's even a classic Scout-style sash to put your badges on. This has the potential to being a cool incentive to get your friends to finally stop skipping game night. You can buy multiple sets, and as they overfund, the stretch goals will add more available sets of badges. There are 10 days left to go on the campaign, so get your badges quick, or these achievements will stay locked.